Bob and Diane Grubb talk with a customer Thursday afternoon at the Craig Farmer’s Market in Alice Pleasant Park. — The farmers market will convene weekly during the summer through Sept. 20. It includes an emphasis on homegrown food items or homemade crafts. For more information on signing up for a booth, call Bob or Diane Grubb at 620-4243. Jars of salsa, freshly grown produce, handcrafted knick-knacks. If you can grow it or make it, the Craig Farmers Market wants you. The Farmers Market is in the middle of its high point during the summer months, as patrons turn out Thursday afternoons at its downtown location in Alice Pleasant Park to check out local and regional products. Offering everything from produce like Palisade peaches and Olathe sweet corn to meals like homemade burritos to crocheted clothing items, area growers and artisans always have something new to offer. Husband and wife Juanita and Wes Romans set up a small sampling of their large inventory of handcrafted wood items made by Wes for their business, Romans Barbarians Woodworks, Inc. They also sell out of their home at 1291 Mariana Way. Juanita said her husband can make anything from wood from small picture frames and gaming boards to bed frames and everything in between. Among the items on the Romans’ table were finely carved birdhouses and shelves, as well as a portfolio showcasing everything else Wes has made over the years. Juanita said they have only manned a booth at the market once so far, but she plans to do it for the rest of the season, earning back her booth fee within hours. 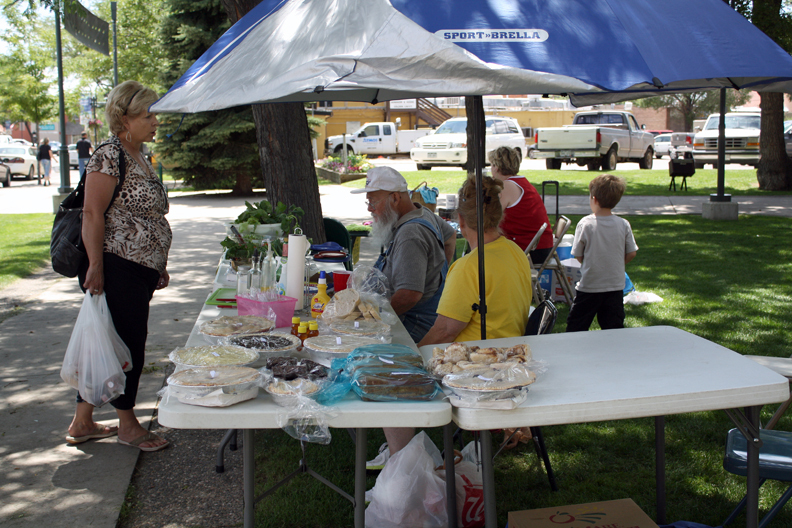 Coordinators Bob and Diane Grubb, selling salads and baked goods, said they have 18 vendors signed up throughout the summer, though not all of them set up every week. The couple said they see an average of 30 to 40 people stop by their booth each week, a little lower than they’d like but still favorable. Though the size of crowds varies from week to week, the people who turn out always do so enthusiastically. Kailey visited the market Thursday with her sister, Jasmine, and their friend, Cody Adams, picking up some homemade jam, pickles, granola and bread from vendors.